Punk Johnny Cash’s piece on innovation is a good reminder that the ability to create is not a historical trait unique to the capitalist system. While I agree with the conclusions–of the need for a reorganization of society around cooperation, a society where, as Marx wrote, “the free development of each is the condition for the free development of all”–its worth taking a closer look at the individual points. First, PJC insists that innovation occurs not because of capitalism, but despite it, as if innovation is held back by capitalism. While the rest of the piece supports this to a point (the idea that an egalitarian economy would allow the free time for all to create for the benefit of all), the notion that capitalism cannot be a genuine place for innovation falls short. This is not meant to be a defense of capitalism, but a critical examination of the system. Why has appeared to be so successful if that is not the case? I am not necessarily countering PJC’s main point when I argue that much of that “success” has been because of a kind of innovation that only capitalism can foster. As Marx and others stressed, capitalist endeavors require growth in order to stay alive, and the development of new technologies is part of that growth. Capital, as a relation, functions such that a venture’s return must exceed its investment, Marx illustrates this relation as M-C-M. Money-Commodity-Money. The commodity should sell for more money than was invested in it. Generally, that excess money comes from the exploitation of labor, where the productive worker is paid for only a portion of the total time they spend in the firm. The excess may also come from the investment in fixed capital–machines, factory space, etc–that more efficiently use the worker’s time. By paying workers less for their time and their output, the firm is able to extract more excess value (closely related to, but different than, profit) out of the process. In this sense, capitalism relies on innovation in order to grow. 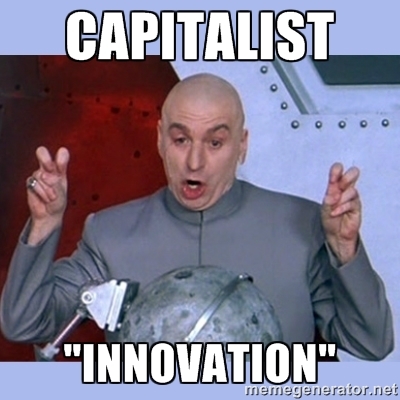 In other words, innovation is central to capitalism. In our work in liberatory movements, in a time when such movements have become small and disjointed, there is an insistence that we need a “broad-based strategy” that encompasses as many people as possible. This typically means that regardless of a person’s stake in a given problem, they have a place in the movement that seeks to solve the issue. While this would seem to promote basic principles that have historically propelled movements forward (solidarity, diversity, etc), the result can actually be the opposite of the desired effect. In Cincinnati, an incomplete analysis of past movements means we continue to repeat the problems that caused those movements to fail. This is the case when we promote ideals that may fall under the umbrella of “economic diversity” both within our movements and as a stated goal of them. To understand this, it is important to realize what kind of movement is needed to win. To really win. The ultimate victory in the protracted economic war is the total and complete annihilation of our enemies in the capitalist ruling class. No exaggeration is intended; only by removing the economic elite from power can the goal of economic equality be achieved. By letting those that rule into our movements, we lose sight of what is achievable. A movement against the power of landlords should not include the landlords. A movement against the power of bosses should not included the bosses. A movement against the power of private institutions in public life should not include private institutions. These contradictions cause friction within movements that muddy the waters and crucially cause us to set our sights too low. The most apparent limitation created by such an alliance with the bosses or the landlord relates to numbers. While those who may not suffer from perennially unstable housing or labor conditions may be able to interact with the oppressors, those that are being directly affected by a social problem can’t enter into a coalition with those that are the purveyors of those problems. Employees in a workplace can’t become allies with their boss in a time when the boss is threatening layoffs. The landlord who is putting his tenants out to renovate the building will not fight for the interests of his tenants at the cost of his own interests. Thus, to enter into a coalition with bosses or landlords means we exclude large amounts of workers and tenants whose interests are in direct opposition to those individuals. The struggle around the Anna Louise Inn provides a good windows through which to examine this. In 2013, a coalition was formed to be the boots on the ground in the defense of the Inn from the onslaught spearheaded by Western & Southern and the heads of the company, notably chairman John Barrett. While a court battle raged on for several years, we understood our role to be keeping the issue in the public eye and putting pressure on Western & Southern. We held meetings and protests on an almost weekly basis, entered artwork into public shows and attended speakouts. We even created buttons that read “John Barrett is a bully.” Still, there were members of the coalition who routinely questioned the language that, to them, alienated Barrett. Some insisted that we must “leave the door open” to Barrett for collaboration or compromise, that he should be able to be involved with our movement if he so chose. This concern was never expressed with regards to the women of the Inn, who (as those of us involved understood it) were told not to participate for legal reasons. Worries about alienation were misplaced. Throughout the fight, Barrett proved himself unworthy of redemption and unwilling to relent. This showed in the summer when he eventually won the war of attrition and called his victory a “win-win,” even while the Inn was forced to move and caved to almost all of the demands of one of Cincinnati’s largest corporations. He and those with similar interests in seeing the Inn removed continually stepped up rhetoric and fought on every legal channel they could, appealing every ruling and suing over every code infraction they we able to construct. What the struggle and the result illustrated is the underlying truth about claims of economic diversity: it is a temporary condition that exists only by permission of the oppressors. This is the case throughout the history of the Inn. It was created a century ago through the philanthropy of the Taft family, whose status as a ruling class dynasty stretches back several hundred years (and continues to this day). The family was so concerned with the plight of working class women, the story goes, that they built a home for such women on their front lawn. Nevermind that it was through the exploitation of working class labor that the Tafts gained their wealth in the first place. Nevermind that it was only through the decision of the Taft family that the women of the Inn be allowed to have an affordable space to live in a posh section of town. We are supposed to ignore these facts and laud the Tafts for their forward thinking nature in a time seemingly akin to the dark ages. The same is true of the ultimate removal of the Inn from the original location. While Western & Southern, who owns the majority of property around Lytle park where this Inn is located, had supported the Inn with modest financial support in the years leading up to the fight, it finally decided that the park was no place for the Inn and its residents who were vilified as drug addicts, prostitutes, homeless and generally unmannered. It should have been no surprise that appeals to the morality of John Barrett would ultimately fail. Capitalism, functioning as it is designed to, puts the drive for profit and growth over the drive for human dignity and respect. This forced removal is the defining aspect of the neoliberal transformation of cities. Ten blocks North of the Anna Louise Inn is the neighborhood of Over-the-Rhine, ground zero for gentrification in Cincinnati. When the gentry speak of the neighborhood, they stress the need for economic diversity, oftentimes ahead of racial diversity. The claims of the economic diversity function mainly to put the blame for the neighborhood’s historic poverty on the poor themselves. The new residents are to serve as a role model for those who have lived in the neighborhood for decades. And even if the residents are removed as a result of the redevelopment, surely they will learn how to take care of their environment in their new surroundings. The rhetoric again, shifts onto the poor, usually black, residents. The windows, broken and neglected, are themselves the cause of the decline of the neighborhood along with the trash on the street and the vacant lots and buildings. Trash begets trash, crime begets crime. The victim, then, becomes not the oppressed people in the neighborhood, but the neighborhood itself. They neglected you, Over-the-Rhine, but we are here to save you. And here we have the neoliberal vision of the neighborhood, a self-serving construction of the financial elite in the city. When representatives of the redevelopment apparatus describe the future, it seems so clear. Wide sidewalks, a bustling nightlife, and (they stress) economic diversity. But they never give a clear definition of their vision for the last point. When will the equilibrium be reached? If the last 20 years is any indication, it requires a continual removal of the poor as much as it requires an influx of the privileged. If the neighborhood is moving in any direction, it certainly isn’t the direction of the long-term residents. New changes don’t relate to working class people, certainly not those raising children on a part-time minimum wage job. Restaurants and bars cater to a clientele who can afford five dollar beers and twenty dollar sushi. And any benefit long term residents may see are rare and fleeting. It is the likes of 3CDC and City Council, Jim Tarbell and Laure Quinliven, property owners and landlords, who promoted and built this new vision of the neighborhood that are the true beneficiaries. It is they who have guided the systematic alienation and oppression of the neighborhood residents over the years. Their kind are no ally of ours, for their ultimate interests are completely their own. Their interests are the complete opposite of ours. Economic diversity is a tool used by the rich to have their deadly interests taken seriously. It suggests that there is a point at which the antagonisms embedded in neoliberalism will reach a balance point. But capitalism must always grow, the working class must always be further exploited, and the system must continually eat itself up at the cost of everyone in it. There can be no balance point. Economic diversity fogs the lens through which we view the world. It manipulates us into believing that, in some way, we are to blame for the failures inherent to the system. This internalization is not unlike the way that capitalism forces women to internalize misogynist shame or for blacks to internalize racism. The insistence, without question, that we need “economic diversity” is a cause of the issues that we face in building an actually diverse group. Including the development of black, women leadership in our movements. The use of neoliberal language and tactics will create the same result as the neoliberal process itself. If we want to win, we should drop the neoliberal rhetoric around economic diversity and promote a truly radical idea: a neighborhood of, by and for the working class. A neighborhood whose diversity is measured by the racial makeup and cultural output of the residents. With all the housing and jobs needed to support the thousands of residents that live there. We should argue for this for all neighborhoods to the point where the ruling class as no place whatsoever. We should smash the towers from which they rule. We should no longer appeal to charity of the super rich or the rare good hearted landlord. We should recognize who our allies are: the working class who suffer under capitalism, especially those who are targetted most directly and affected most severely by it. I myself have historically take a rather crude view of all this, advocating a boycott of Over-the-Rhine by all those who are concerned with the changes affecting the neighborhood. But this does not go far enough. It does not strike to the heart of the issue, which is that the interests of the propertied are in direct opposition to the propertyless. This includes many of the bar patrons and workers, the construction crews and shop clerks, against the bosses and the property owners. A boycott may affect the bottom line of this or that business, but even a successful boycott leaves the underlying system (and the underlying antagonisms) in place. We should be able to say who the enemy is and should not be afraid to call out these villains for who they really are. They are the exploiter, the robber baron, the media mogul, the money grubbing capitalist. They are the residents of Indian Hill and the lofts, looking down from high above street level. They are the historic oppressor. And we should not be forced to accommodate to their needs. For every inch we give them, they will demand more, even while they are the ones with all of the extra ground to stand on. It should not be us who is compromising the message for the Enquirer or the UrbanCincy blog. It is they who must eventually be forced to submit to the demands of a movement that represents the true liberation of the residents of Over-the-Rhine and the whole city. We should not be made to tone down our rhetoric so that those with dubious interests may find a home in our movements. It is not us who need to change, it is they. We should stand by our understanding of why things are the way they are. Because, contrary to what they may claim, ours is based on the historical understanding of how things change–how things “progress.” We understand the function of ideology and we attempt to wield it. They deny that ideology exists even as they are steeping in it. It is only when large groups of people rise up and demand to be heard that power listens. Our movements must be about removing the power and money from the people that hoard it and we must call for the dismantling of the structures that allow that to happen. Because it is only through such a movement that the powerful will fall so that we, the democratic masses, may take their place. We should not lose sight of this goal. See my previous piece “On Common Ground” to get more information on this phenomenon.